Introduction: Diabetic ketoacidosis (DKA) is the most common hyperglycemic emergency in patients with diabetes mellitus (DM). Further, atrial fibrillation (AF) incidence is higher in diabetic patients. P wave dispersion (PWD) is a non-invasive electrocardiographic parameter and increases in patients with atrial arrhythmias such as AF. The aim of this study was to examine the effect of DKA on PWD. Methods: Fifty-three type 2 DM patients with DKA were included in the study. All patients had sinus rhythm and laboratory parameters such as blood glucose, urinary ketones, electrolytes, urea, creatinine, arterial blood gas were measured. We performed the standard 12-lead electrocardiogram to all patients and PWD was calculated as the difference between the longest and shortest P wave duration (PWD=Pmax-Pmin). Pmax, Pmin and PWD were measured during ketoacidosis and reevaluated at least six hours later from urinary ketone being negative. Results: The majority of the patients were female (F/M: 37/16) and the mean age was 53.1±15.0 years. The mean plasma glucose level was 400.6±119.1 mg/dL. We detected that PWD and Pmax during ketoacidosis was higher than six hours later from urinary ketone being negative [60 (40-100) ms; 40 (20-60) ms, (p<0.001) and 110 (100-140) ms; 80 (80-120) ms, (p<0.001) respectively]. There was no significant relationship between PWD and Pmax with regard to any biochemical and demographic data. Conclusion: The results showed that PWD, which is a predictor factor for atrial artyhythmias, is increased during ketoacidosis and decreased after treatment of ketoacidosis. Therefore, we suggest that these patients should be monitored during ketoacidosis treatment for following up arrhythmias. Amaç: Diyabetik ketoasidoz (DKA) diyabetes mellitus (DM) olan hastalarda en sık hiperglisemik acil durumdur. Ayrıca atriyal fibrilasyon (AF) insidansı diyabetik hastalarda yüksektir. P dalga dispersiyonu (PDD) bir noninvaziv EKG parametresidir ve AF gibi artiyal aritmili hastalarda artmaktadır. Bu çalışmanın amacı, DKA'nın PDD üzerine etkisini incelemektir. Yöntem: Çalışmaya acil servise DKA ile başvuran 53 tip 2 DM hastası alındı. Tüm hastalar sinüs ritmindeydi ve kan glukozu, idrar ketonu, elektrolitler, üre, kreatinin, arteriyal kan gazı gibi laboratuvar değerleri ölçüldü. Tüm hastalara standart 12 derivasyonlu EKG çekildi ve PDD en uzun ve en kısa P dalga süresi arasındaki fark olarak hesaplandı (PDD=Pmaks-Pmin). Pmaks, Pmin ve PDD ketoasidoz sırasında ölçüldü ve idrar ketonunun negatifleşmesinden en az 6 saat sonra tekrar değerlendirildi. Bulgular: Hastaların çoğunluğu kadındı (K/E:37/16) ve ortalama yaş 53.1±15.0 idi. Hastaların ortalama plazma glukoz seviyesi 400.6±119 mg/dL idi. PDD ve Pmaks'ın ketoasidoz sırasında, idrar ketonu negatifleştikten 6 saat sonrasına göre daha yüksek olduğunu belirledik [60 (40-100) ms; 40 (20-60) ms, (p<0.001) ve 110 (100-140) ms; 80 (80-120) ms, (p<0.001)]. PDD ve Pmaks ile biyokimyasal ve demografik özellikler arasında anlamlı bir ilişki yoktu. Sonuç: Sonuçlar, atriyal aritmiler için belirleyici bir faktör olan PDD'nin ketoasidoz sırasında arttığını ve ketoasidoz tedavisi sonrası azaldığını göstermiştir. Bu nedenle, bu hastaların ketoasidoz tedavisi sırasında aritmi takibi açısından monitörize edilmeleri gerektiğini düşünmekteyiz. Fidan C, Yavuz B, Şen Ö, Ertuğrul DT, Nazlıgül Y. Increased P Wave Dispersion In Patients With Diabetic Ketoacidosis. TJFM&PC, 2016;10(2):63-68. Diabetes mellitus (DM) is a chronic metabolic disorder and diabetic ketoacidosis (DKA) is one of the most important emergency complications of DM. The frequency of cardiovascular disease is increased in diabetic patients, also DM is an independent and strong risk factor for development of atrial fibrillation (AF).1 The arrhythmia as AF presence and frequency are significantly associated with increased morbidity and mortality.2 Previous studies demonstrated that prolonged PWD was an independent risk factor for AF and has been extensively used to evaluate risk of AF attacks in different clinical situations.3-7 Although, cardiac arrhythmias and arrhythmia parameters in patients with type 2 DM were studied previously2,8, it has not been studied in DKA in which metabolic disorders causing emergency are at the forefront. In this study, we assessed PWD, which is a significant predictive parameter for AF, and investigated the frequency of cardiac arrhythmias in type 2 DM patients with DKA. So that, increased mortality in diabetic patients with AF may be reduced. We evaluated 118 patients with a diagnosis of DKA, who applied to the emergency department of Keçiören Teaching and Research Hospital, between September 2006 and January 2009. A total of 53 DKA in type 2 DM patients, between 30-75 years of age, who complied with the inclusion criteria, were included in the study. Patients with chronic AF, endocrine disorders other than DM, liver and renal failure, psychosis, patients on drugs affecting central nervous system or affecting P wave and QT interval, uncontrolled hypertensive patients, patients with abnormal serum electrolyte levels during admission, and patients with breast-feeding or pregnancy status were excluded from the study. Nine patients were newly diagnosed with DM and 44 patients had previously diagnosed DM. The median diabetes duration was 6 (min-max = 0-25) years. Those patients with resting ECG abnormalities (Wolff Parkinson White syndrome, right bundle branch block, left bundle branch block, intra-ventricular conduction delay) were also excluded from the study. The study enrolled patients who met the DKA diagnostic criteria, which were blood glucose levels >250 mg/dL, acidemia (pH<7.35) and ketonuria. The diagnosis and treatment of DKA was based on the criteria of American Diabetes Association (ADA) guideline.14 Medical history was obtained and detailed physical examination was performed in all patients. In terms of diagnosis and treatment of patients with DKA, the laboratory evaluation was performed before and after treatment. Plasma glucose, electrolytes, blood urea nitrogen (BUN), creatinine, complete blood count, arterial blood gas (ABG), urinalysis (urine ketone), aspartate aminotransferase (AST), alanine aminotransferase (ALT), lipid profile (cholesterol, high density lipoproteins, low density lipoprotein, and triglycerides) levels of the participants were measured. The measurement of arterial blood gases routinely are obsolete, because bicarbonate levels, mental status, vital signs, insulin dose, administred fluid and electrolytes, and urine output are accepted as relatively good indices therapy response.15,16 A resting 12-lead ECG during the DKA was obtained and another ECG measurement was performed at least six hours after negative urinary ketone measurement. All the patients were monitored for arrhythmia. High quality 12-lead ECG recording was performed to all patients. Patient with P wave measurements in all derivations and clear identifiable beginning or end of the P wave traces were included in the study. An initial ECG of each subject was recorded during the DKA period. A second ECG was recorded after DKA treatment (at least six hours following confirmation of absence of urinary ketone). Recordings were performed during spontaneous breathing in the supine position. All standard 12-lead ECGs were obtained using the same recorder (PETAS® brand kardiopet 600 ECG device). ECG recording speed was set to of 25 mm/sec and 10 mV/cm. Patients were allowed to breathe regularly, but talking and breath holding were not allowed during measurements. Pmax and Pmin value of each ECG were recorded by two cardiologists, who were blinded to the clinical and biochemical data of the patients. The ruler and a magnifying glass were used to reduce the margin of error. The P wave deflections point, which separated from isoelectric line was accepted as the beginning of P wave, and the point where P wave intersected isoelectric line were accepted as the end point. 12-lead ECG P wave duration on the longest and shortest periods were measured and the difference was accepted as PWD (PWD = Pmax - Pmin). The distribution of numerical variables was assessed by Kolmogorov-Smirnov test. All numerical variables with normal distribution were expressed as mean ± SD, abnormally distributed variables were expressed median (minimum-maximum) and categorical variables were expressed as percentages. Paired sample t-test was used for normally distributed variables and Wilcoxon rank-sum test was used for abnormally distributed variables. Pearson or Spearman correlation test were used for the correlation measurements, where appropriate. A p-value < 0.05 was determined as statistically significant. The statistical analyses were performed by using SPSS statistical software (ver.10.0, SPSS, Chicago, IL, USA). We studied 53 type 2 DM patients (mean age: 53.1±15.0) with DKA. 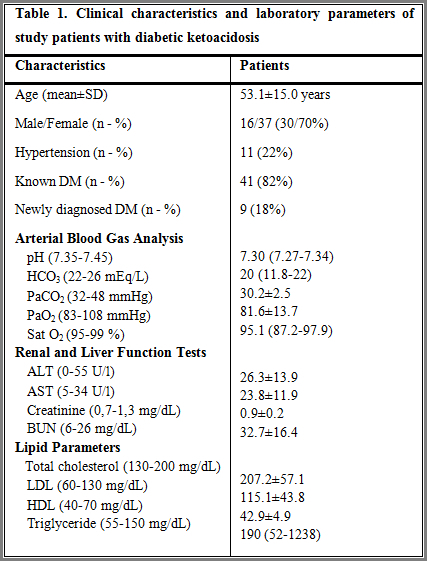 Baseline characteristics of the patients are shown in Table 1. Laboratory parameters were measured for all patients during the DKA period and afterward including blood glucose (400.6 ± 119.1 mg/dL vs. 199.6 ± 68.0 mg/dL, p < 0.001 respectively), urine glucose (748.0 ± 346.8 mg/dL vs. 429.3 ± 110.2 mg/dL, p < 0.001 respectively), and urine density [1020 (1005-1040) vs. 1015 (1003-1029), p < 0.001 respectively]. All were significantly higher during ketoacidosis. 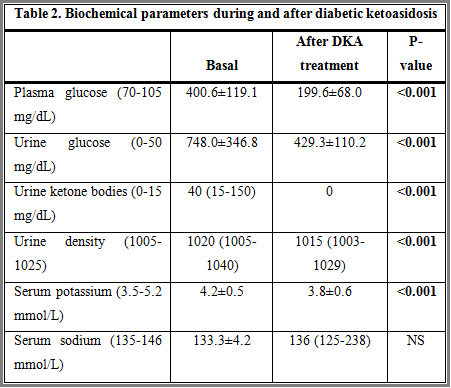 Although levels of serum potassium and sodium were within the normal range in all subjects; serum potassium levels (4.2 ± 0.5 mmol/L vs 3.8 ± 0.6 mmol/L, p < 0.001 respectively) was significantly higher during ketoacidosis than after ketoacidosis (Table 2). 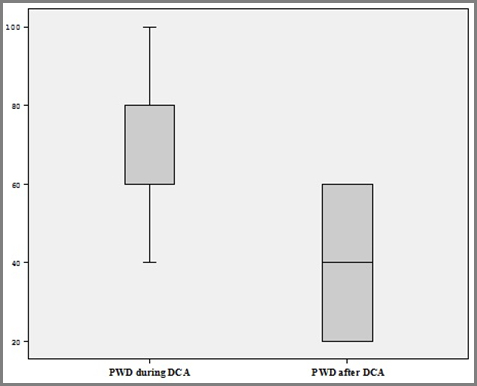 We found that PWD value was significantly higher during DKA than after treatment (Figure 1). PWD was 60 (40-100) ms during ketoacidosis and 40 (20-60) ms six hours later from urinary ketone being negative (p < 0.001). However, there was no significant relationship between PWD and any biochemical parameters and demographic characteristics. 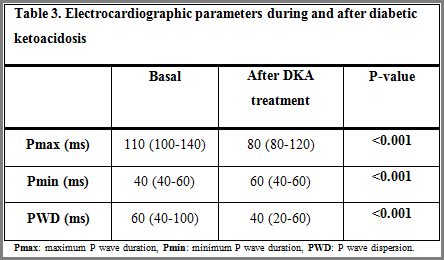 Electrocardiographic parameters during and after DKA are demonstrated in Table 3. No significant correlation was found between PWD and plasma glucose levels during ketoacidosis. We detected that 4 patients developed paroxysmal atrial fibrillation (PAF) and other 4 patients developed supraventricular extrasystole (SVE) in the course of DKA treatment. The longest of arrhythmias lasted 1 minute, others are short-lived. If the patient had a CHADS-VASc score of 2 and above, oral anticoagulation therapy with warfarin (with target INR of 2-3) was started.16 No other arrhythmia episodes were detected. During DKA, we found that PWD value was significantly higher in patients with atrial arrhythmias, including PAF and SVE, than without (80 (60-100) ms vs. 60 (40-80) ms; p < 0.017) (Figure 2). It has been shown that DM is a powerful and independent risk factor for the development of AF.1 AF is often accompanied by DM and raises the mortality in diabetics. Studies investigating the relationship between DM with PWD, which is one of the predictors of AF in patients with DM are scarce. DKA is one of the most important acute complications of DM, which arises after acid-base balance disorders, electrolyte imbalance, and autonomic nervous system. Fluctuations and hormonal factors (insulin deficiency, counter-regulatory hormones increase) may cause impairment of atrial tissue electrical homogeneity. Atrial electrical heterogeneity may result in an increase in PWD17,19. The mechanisms of PD prolongation were not investigated in this study. Patients with significant electrolyte imbalance were not included. There is so far no study to our knowledge, demonstrating increased P wave dispersion in DKA. Our study also claims for the first time that PWD, which is known to be a marker of AF, is increased during DKA and improved with treatment. The difference in PWD before and after treatment of DKA might imply a possible electrical instability of the heart. It is advisable that ECG should be performed during ketoacidosis in order to detect and follow-up atrial arrhythmias in diabetic patients. We realized that the incidence of AF was increased during DKA in our patients. At the same time, we have observed other cardiac arrhythmias as SVE besides AF during ketoacidosis. 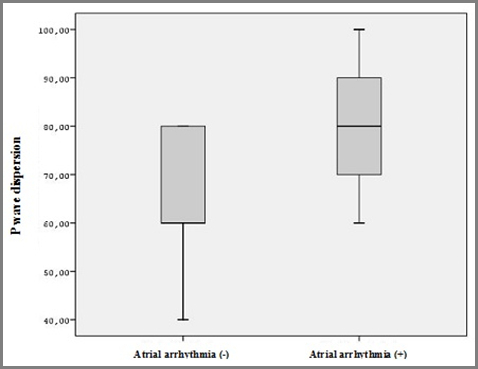 This prominent increase in PWD can be considered as an indicator of possible risk for atrial arrhythmia. Potential limitations of this study should be addressed. Other arrhythmia parameters such as QT dynamicity and heart rate variability and myocardial perfusion SPECT analysis in association with PWD may give more information about the etiology of increased PWD in DKA patients, but these tests are more expensive and complex and may not be necessary in patients without overt heart disease. This study emphasized PWD in DKA, which is rare. Another limitation is the involvment of one single center with a relatively small number of participants. To clarify the effect of such differences on PWD studies with large populations are needed. This study demonstrated that PWD on ECG is increased during DKA and decreases after treatment of ketoacidosis. Diabetic patients are at increased risk of atrial arrhythmias, which are frequently overlooked, during DKA treatment. Screening DKA patients with PWD, measured by 12-lead ECG, may help identify atrial arrhythmias such as AF and consequently may reduce the mortality and morbidity. We suggest therefore that these patients need to be monitored more closely during the DKA treatment. 1. Demir K, Avci A, Kaya Z, Marakoglu K, Ceylan E, Yilmaz A, et al. Assessment of atrial electromechanical delay and P-wave dispersion in patients with type 2 diabetes mellitus. J Cardiol. 2015 Jul 8. pii: S0914-5087(15)00185-9. 2. Movahed MR, Hashemzadeh M, Jamal MM. Diabetes mellitus is a strong, independent risk for atrial fibrillation and flutter in addition to other cardiovascular disease. Int J Cardiol 2005 Dec 7;105(3):315-318. 3. Lazzeroni D, Parati G, Bini M, Piazza P, Ugolotti PT, Camaiora U, et al. P-wave dispersion predicts atrial fibrillation following cardiac surgery. Int J Cardiol 2016 Jan 15;203:131-133. 4. Páll A, Czifra Á, Sebestyén V, Becs G, Kun C, Balla J, et al. Hemodiafiltration and hemodialysis differently affect P wave duration and dispersion on the surface electrocardiogram. Int Urol Nephrol 2016 Feb;48(2):271-277. 5. Akbal A, Kurtaran A, Gürcan A, Selçuk B, Batgi H, Akyüz M, et al. P-wave and QT dispersion in spinal cord injury. Intern Med 2014;53(15):1607-1611. 6. Francia P, Ricotta A, Balla C, Adduci C, Semprini L, Frattari A, et al. P-wave duration in lead aVR and the risk of atrial fibrillation in hypertension. Ann Noninvasive Electrocardiol 2015 Mar;20(2):167-174. 7. Izci F, Hocagil H, Izci S, Izci V, Koc MI, Acar RD. P-wave and QT dispersion in patients with conversion disorder. Ther Clin Risk Manag 2015 Mar 26;11:475-480. 8. Tadic M, Cuspidi C. Type 2 diabetes mellitus and atrial fibrillation: From mechanisms to clinical practice. Arch Cardiovasc Dis 2015 Apr;108(4):269-276. 9. Dilaveris PE, Gialafos JE. P-wave dispersion: a novel predictor of paroxysmal atrial fibrillation. Ann Noninvasive Electrocardiol 2001 Apr;6(2):159-165. 10. Koide Y, Yotsukura M, Ando H, Aoki S, Suzuki T, Sakata K, et al. Usefulness of P-wave dispersion in standard twelve-lead electrocardiography to predict transition from paroxysmal to persistent atrial fibrillation. Am J Cardiol 2008;102(5):573-577. 11. Elmoniem AA, El-Hefny N, Wadi W. P Wave Dispersion (PWD) as a predictor of Atrial Fibrillation (AF). Int J Health Sci (Qassim) 2011 Jul;5(2 Suppl 1):25-26. 12. Aytemir K, Ozer N, Atalar E, Sade E, Aksoyek S, Ovunc K, et al. P wave dispersion on 12-lead electrocardiography in patients with paroxysmal atrial fibrillation. Pac¬ing Clin Electrophysiol 2000; 23: 1109-1112. 13. Karabag T, Aydin M, Dogan SM, Cetiner MA, Sayin MR, Gudul NE, et al. Prolonged P wave dispersion in pre-diabetic patients. Kardiol Pol 2011;69(6):566-571. 14. American Diabetes Association. Standards of medical care in diabetes. Diabetes Care 2005;28(1): 54-71. 15. Eisenbarth GS, Buse JB. Type 1 Diabetes Mellitus - Acute Diabetic emergencies: Diabetic Ketoacidosis. P. Reed Larsen, Henry M. Kronenberg, Shlomo Melmed, P. Reed Larsen. Williams Textbook of Endocrinology, Edition 10. Philadelphia, Elsevier Saunders, 2002. 1453-1458. 16. Camm AJ, Lip GY, De Caterina R, Savelieva I, Atar D, Hohnloser SH, et al. 2012 focused update of the ESC Guidelines for the management of atrial fibrillation: an update of the 2010 ESC Guidelines for the management of atrial fibrillation developed with the special contribution of the European Heart Rhythm Association. Europace 2012 Oct;14(10):1385-1413. 17. Daubert JC, Pavin D, Jauvert G, Mabo P. Intra- and interatrial conduction delay: implications for cardiac pacing. Pacing Clin Electrophysiol 2004 Apr;27(4):507-525. 18. Uysal F, Ozboyaci E, Bostan O, Saglam H, Semizel E, Cil E. Evaluation of electrocardiographic parameters for early diagnosis of autonomic dysfunction in children and adolescents with type-1 diabetes mellitus. Pediatr Int 2014 Oct;56(5):675-680. 19. Kalpana V, Hamde ST, Waghmare LM. ECG feature extraction using principal component analysis for studying the effect of diabetes. J Med Eng Technol 2013 Feb;37(2):116-126. 20. Yazici M, Ozdemir K, Altunkeser BB, Kayrak M, Duzenli MA, Vatankulu MA, et al. The effect of diabetes mellitus on the P-wave dispersion. Circ J 2007;71(6):880-883. 21. Tsioufis C, Syrseloudis D, Hatziyianni A, Tzamou V, Andrikou I, Tolis P, et al. Relationships of CRP and P wave dispersion with atrial fibrillation in hypertensive subjects. Am J Hypertens 2010 Feb;23(2):202-207. 22. Yasar AS, Bilen E, Bilge M, Ipek G, Ipek E, Kirbas O. P-wave duration and dispersion in patients with metabolic syndrome. Pacing Clin Electrophysiol 2009 Sep;32(9):1168-1172. 23. Ostgren CJ, Merlo J, Råstam L, Lindblad U. Atrial fibrillation and its association with type 2 diabetes and hypertension in a Swedish community. Diabetes Obes Metab 2004 Sep;6(5):367-374. 24. Bissinger A, Grycewicz T, Grabowicz W, Lubinski A. The effect of diabetic autonomic neuropathy on P-wave duration, dispersion and atrial fibrillation. Arch Med Sci 2011;7(5):806-812.